The best blenders for green smoothies are many and they come in all flavors. If you are looking for one that will give you enough power to make green smoothies for a lot of people, your needs will be satisfied. But that will mean a machine that is expensive and big. For those looking for smoothies just for themselves will also find blenders that are both small and cheap. This article has it all. Blending is, without doubt, one way we all can follow in an effort to improve our health. Not only does it enable us to consume a lot of vital nutrients at once, but it also fills us up reducing the chance of opting for other unhealthy food choices. As a matter of fact, blending is now one way many are following when trying to lose weight. But for all this to happen, you will first need to get a good blender. Just spending your money on anything you can come across will not be the best decision. As you might already know, the best blenders for making green smoothies come at a cost. With the state of the economy, not everyone can afford these. That is why we have other models like the Nutribullet Pro 900 series. In as far as making green smoothies is concerned, it does the job outstandingly. It comes with a 900-watt motor which is a step up of its little brother the Nutribullet 600. Using this blender for making green smoothies is as easy as you can imagine. You just fill the jar with ingredients, put it on the motor base, push down and then twist. You will feel it start and watch the ingredients get pulverized. There are no buttons to press which makes it easier to use. And because of this, it means there is no option of changing speeds. The blades on the Nutribullet Pro 900 are very sharp that you are warned to exercise great caution when cleaning them. But on a positive note, they are much better at breaking tough skin of plants. You will notice that the presence of large chunks is very rare most of the times. You should, however, avoid overfilling the jar as that might lead to leaking and less satisfactory results. To sweeten the deal even further, there is a recipe book already included. So there is no need to go hunting for recipes as these will be enough for a start. Apart from that, BPA free material was used in making this. And for those always on the road, you will love the fact that the cups are designed with portability in mind. The Nutribullet Pro 900 series comes with a 1-year limited warranty. Its parts are dishwasher safe except for the motor base, of course. All in all, this is a great blender. It is compact and elegant making it easy to keep on the counter. If you are planning on using it just yourself, there is no way you can go wrong with it. If we were to award the best blender manufacturer in the world, Vitamix would surely give the others a good run for their money. Without question, it is difficult to not be impressed with the quality of Vitamix blenders. The Vitamix 5200 does not abandon those principles and it is the reason it is here as one of the best blenders for green smoothies. From just the looks of it, you can tell that this will last years because it is as solid as a rock – but that also means it is big and heavy. With a 2HP motor, making green smoothies can never get any better. 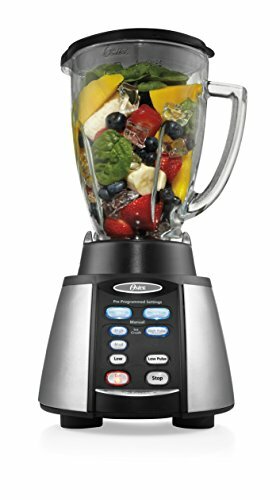 If you have used a cheap blender before, you will be able to tell the difference in quality with the smoothies you will get from this beast. It offers variable speeds which is important in ensuring great results from each food. The controls on the Vitamix 5200 are not enough to scare the devil out of anyone. But being so powerful means one thing – lots of noise. Since it can get very hot thereby shortening its lifespan, it has a cooling fan. Perhaps this is one reason it is able to last years without any issues. It is very rare to have a Vitamix blender burn on your regardless of how heavy you use it. Cleaning this blender is so easy. You just add some water and blend for a few seconds. So even if you are a busy person, you will still love how convenient it is. Considering its high price, it makes more sense if only those who use blenders heavily invest in this. Its high amount of power will guarantee that you get quality smoothies daily while the included fan will keep the machine cool. If you have the money, this is one machine you should invest in. You will save more in the long run. 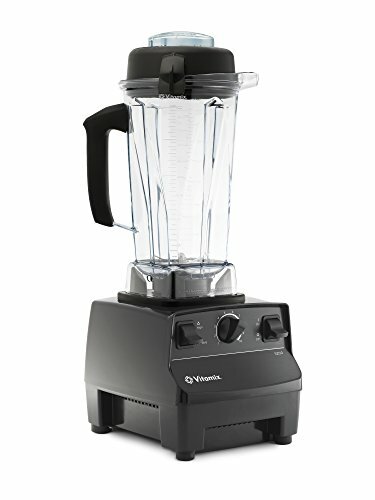 While the Vitamix 5200 might be the best there is, you should know that there are perfect substitutes that are both cheaper and offer great quality. One of those is the Blendtec. Keeping this under the cabinet is easy as it is not as tall as the Vitamix 5200. In addition to that, it comes in a number of colors. Topping it all is that it has an attractive design so you will have no problems keeping it on the counter. The Blendtec comes with a 3HP direct drive motor. Despite being more powerful than the one in the Vitamix 5200, you will notice no difference in the quality of green smoothies these two can make. And as you would expect, this one is louder than its biggest competitor. The Blendtec comes with digital touchpad controls which are a joy to use. It also has pre programmed circles – these are great for beginners and help result in perfect results every time. The blending jar is 2-quart in volume and it is BPA free. Surprisingly, it is lighter than you would expect for a blender like this one. Cleaning it involves adding water and then running it for a few seconds – just like in the Vitamix 5200. To make life easier for you, a user guide and recipes have been included. Additionally, you will also get a 3-year warranty on the motor base, 1-year warranty on the jar and a lifetime coupling and blade warranty. If you were to ask me, I would choose this over the Vitamix 5200. This is cheaper and gives the same result as the latter. The truth is not everyone will afford a high-end Vitamix or Blendtec. But then that does not mean there are no best blenders for green smoothies on the lower side. As a matter of fact, there are a couple of them in the lower price bracket that deliver an excellent job in consideration to price. One of them is the Oster BVCB07-Z. It comes with a 600-watt motor that is just adequate for making green smoothies for a few people. The motor has a reversible feature. When it runs for a few minutes, it automatically goes in the opposite direction. This is crucial in making sure that there are no large chunks in your smoothie. In addition to this, it has pre-programmable settings. Some will be happy with these, but those who won’t, will find operating it manually a joy. Getting to how it looks, it is easy to see that a lot of thought was given on the design of the Oster BVCB07-Z. It is very attractive and at the same time, very solid. Who ever made this understood that a kitchen can be a rough place. To prove this even further, it comes with a glass jar which is scratch resistant and also dishwasher safe. Coupled with the stainless steel blades, the Oster BVCB07-Z is definitely worth a look. For those who do not like noise, I am afraid I got some bad news. This blender makes a considerable amount of noise. But that is the case with almost all blenders. With that out of the way, there is nothing else to worry about this blender. For your information, it has a good record of lasting for years. If you are looking for a blender that is good for making green smoothies but will not leave holes in your pocket, then this is something you should seriously consider. 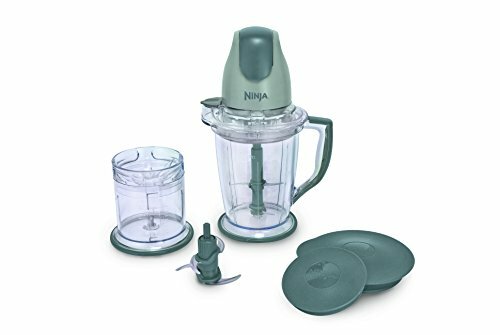 If we were to have a contest of blenders comparing feature for price, the Ninja Master Prep (QB900B) would carry the day. Even though it has a less powerful motor with only 400 watts, you will find that it is still enough for its size. There, of course, other versions like it that come with 450-watt motors. The Ninja Master Prep (QB900B) has 2 jars and they are plastic as you would expect at this price. These are BPA free and are dishwasher safe making work easier. To make it even better, it comes with lids that you can use to store your green smoothies. For a machine with limited power, I find it a little too big. In addition to that, it also makes much noise like any average blender. But despite that, you will love it for being so easy to assemble. Overall, the build quality is impressive. If you are so much into colors, this only is available in silver. But still, that is a color that will look good regardless of your kitchen color. 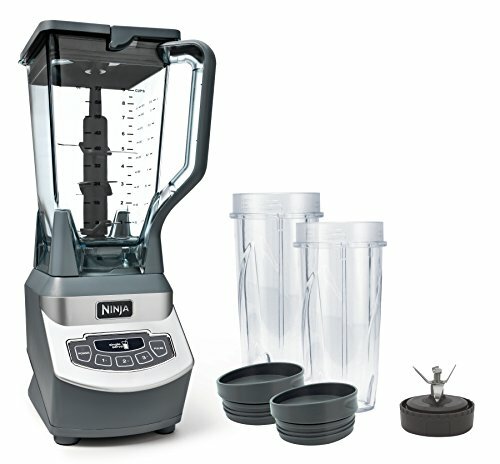 As for the warranty, you will get one for 1 year which is great for a blender this cheap. The fact that it is one of the best-selling blenders on the internet shows that there is something amazing about it. Not only is it cheap, but it also manages to pack all the features you would need. If you are among those trying to save money and still get a good blender for green smoothies, then you might need to include this on your shortlist. They say there is always something for everyone. Those on a budget, but want more power at that same time, will not be disappointed with the Ninja Professional Blender (BL660). From the looks of it, you would think someone was trying to build a Vitamix – just cheaper and less powerful. It comes with 1100 watts of power. Regardless of what green smoothies you will be making in this, this should be enough. It has 3 speeds and a pulse button. While you might agonize and think of getting a small blender when you want to make smoothies just for yourself, you will love to know that this has a single serve function. The blades in this Ninja Professional Blender do an outstanding job and it is rear to find large chunks of food. The manufacturer claims it has Total Crushing Technology which is what guarantees that everything gets pulverized. But all that power is nothing if the blender cannot handle food for the whole family at once. Fortunately, this baby can make 9 cups of a smoothie at a time as it has a 72oz capacity. In addition to that, it has 2 small cups. All these are BPA free and dishwasher safe. So cleaning is as easy as you would want it to be. You will find the included recipes enough to get you started. If not, you can always buy a cheap book online. Not only that, but you will also get a 1-year limited warranty with this machine. All this combined makes this one of the best blenders for green smoothies you can get without breaking the bank. You can have the flashiest blender around. But if you do not know how to use it, it will not make any difference at all. You will still be able to make smoothies, but they will probably not be the best as you will be missing other important techniques. Additionally, improper use of the blender might spell its early death. That is why it is always advisable to read the user guide carefully the first time you get your new machine. Using a blender to make green smoothies is very easy. You do not even need to have a degree in cooking or years of experience working in the kitchen. This guide will show you how easy it is. Before you even think of getting down to business, you should always make sure that it is safe to use the blender. Failure to do so might result in injuries which will take the fun out of making your own smoothies. In addition, there is a risk of damaging your newly bought blender if you do not follow safety procedures. So here are a few tips that will reduce the risk of an accident. These are some of the things that will guarantee that you get an accident free time using your blender. Since all blenders are different and there are many different types for different uses such as blender food processor combo, blenders to make juice, and even portable blenders etc., so when operating a new blender you are advised to refer to your manual. 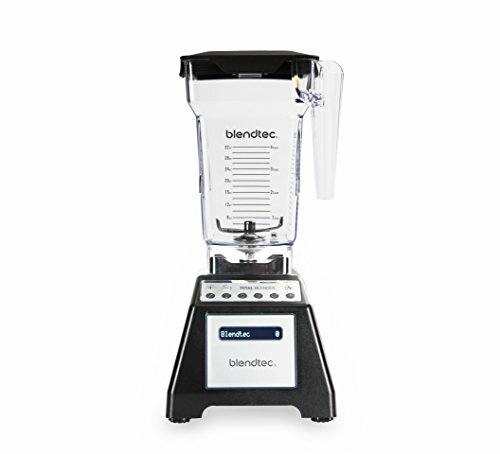 Almost all blenders will come with one. If yours did not, this guide will still help you get started. If it is still in its box, you will need to remove it for cleaning. Make sure that all parts are present and in good condition. Usually, you will find the motor base, blending jar and some blades. You should never immerse the motor base in water – simply use a wet cloth to clean it. After cleaning, assemble it. If you are not sure on how to do this, look in the user manual. Since we are preparing a green smoothie here, you should have some vegetables and fruits in hand. You can get a lot of free and great smoothie recipes online. Once you have all the ingredients, wash them properly. Plants can be dirty so you should spend some time cleaning them. When done, cutting the food into smaller pieces. The size will depend on how powerful your machine is. If you have something like a Vitamix or Blendtec, large pieces will be fine. But if your are using a less powerful blender like the Oster, you might need to cut them even smaller if you really want to have the best results. That will take some time, but it is the price you pay for getting a less powerful blender. The first thing to go in a blender should be liquid. Many like to use milk or soy milk. But you can as well use yogurt or ice cream. Some even like to go for fruit juices. But that adds unnecessary calories and other questionable ingredients to your smoothie. If you do not have any of the liquids above, you can as well use water – it works well most of the times. Adding liquid first creates a vortex that helps in pulling all the ingredients to the blades – resulting in all food being broken down. You can then add your vegetables. If you have fruits, let those go in first before the vegetables. Fruits will sweeten your smoothie. But in case you do not have them, honey is another good alternative. When everything is loaded in the jar, you machine is ready to go. You should, however, try to avoid overloading it. The idea that you will blend a lot of food at once by overfilling is a myth. You will end up with large chunks in your smoothie and it might lead to leakage in other blenders. Like you saw in this article, each blender functions differently. The Magic Bullet Nutribullet Pro 900, for example, does not come with any buttons – you just push the jar down and twist it. So you are advised to refer to your user guide for the exact steps to follow in starting your blender. Generally, however, if you have a pulse button, you should start with that. Run it for 30 seconds – that will help break the food even further guaranteeing that you will get a smooth drink. You can then blend at a low speed first, then change to a higher speed. If you find it is not of a consistency you wanted, simply run it again. Once done, your green smoothie will be ready for drinking. Just pour it into a glass or some cup and your are ready to enjoy it. Always try to clean the blender soon after use. It becomes a little harder if you let it dry. There are some of the best blenders for green smoothies. I am sure you were able to find something that seems will fulfill your needs. If you haven’t thought about it already, you should spend some time and be clear about what it is you are looking for in a blender – you will make a far much better purchase decision that way. Blending is one way you can take care of your health. It has been discovered that many of us now are eating a lot of junk food. Not only is this increasing obesity cases, but it is also depriving us of important nutrients. While many might not like the idea of eating vegetables, blending is the best way to drink them. They even taste better when combined with other foods. All in all, I hope you found this article helpful and I am sure you have decided on which blender you will invest in. Whatever your decision, all these blenders here are good and will help you in achieving good healthy.